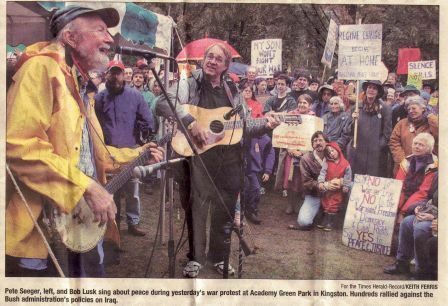 Singing for peace with Pete Seeger. What were those chords Pete? I have a huge selection of peace, justice and freedom songs. I love to sing at demonstrations, rallys and marches. Give me a call! Ain't gonna study war no more!!! Check out my blog pages at http://boblusk.blogspot.com/ for my performing schedule,photos,poetry and lyrics.